Ricardo Alvarez was one of several invited authors who contributed to a peer-reviewed study about the effect of global warming in Florida commissioned by the Florida Climate Alliance and the Natural Resources defense Council. 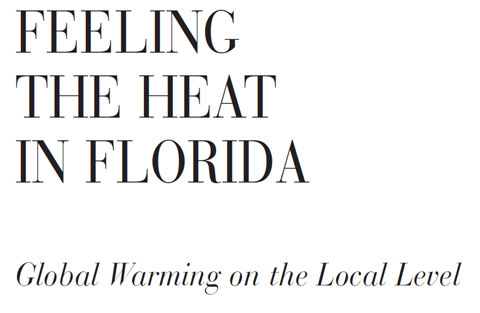 The study titled Feeling the Heat in Florida – Global Warming at the Local Level ( click on this link florida to read the full study) was published in October 2001. Other contributing authors were: Wendell Cropper, Mark Harwell, Dave Letson, Manjo Shivlani and Harold Wanless, all of the University of Miami, Shrikant Jagtap of the University of Florida, John Winchester of Florida State University, Chris Landsea of the National Oceanic and Atmospheric Administration (NOAA), and Cindy Parker of Physicians for Social Responsibility. Although this study was researched, written and published several years ago when the level of uncertainty regarding critical aspects of the science was much higher and the environment at the federal government had turned somewhat hostile with a new administration in government, it is remarkable how focused and relevant this study was and remains today.